Lake Capital Management has acquired a global market research firm, from a portfolio company of CCMP Capital Advisors, LLC. DeSilva+Phillips client Lake Capital Management, a Chicago-based private equity firm, has acquired ORC International, a global market research firm, from Infogroup, a portfolio company of CCMP Capital Advisors, LLC. Infogroup is the leading provider of targeted high-value sales and marketing data, market intelligence and innovative digital engagement solutions. The sale announced today follows several other recent announcements by Infogroup. These include the introduction of a more focused company structure organized around specific sets of client needs; the appointment of a Chief Product Officer; new hires in several strategic sales, account management and technology roles; and the establishment of a new client experience team focused on delivering a single consistent experience across all of the company’s products and services. Over the past several months ORC International has taken a number of steps to differentiate its services and expand parts of its business. In April, the company launched its new FDA and Regulatory Division, which is part of its International Healthcare and Pharmaceutical research division. To address the needs of human resources executives, ORC recently announced a new initiative, engage, an employee survey product designed for small and mid-sized businesses. ORC International was acquired by Infogroup in 2006 and Guideline, which is now part of ORC, was acquired in 2007. DeSilva+Phillips acted as financial advisors in both transactions. 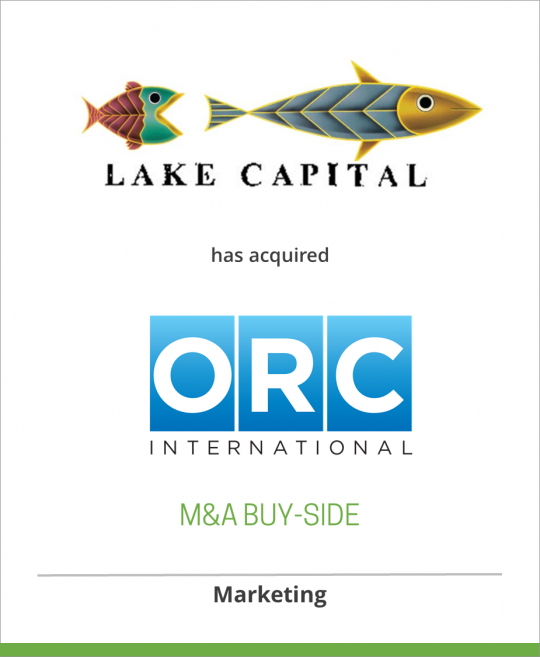 The sale of ORC International to Lake Capital was effective July 1, 2011. Infogroup helps companies increase sales and customer loyalty through our high value data, market intelligence and innovative digital solutions. We uncover and unlock revenue growth by enabling our clients — from local businesses to Fortune 100 companies — to connect and engage with their most valuable audiences millions of times each day. Infogroup data powers the top 5 internet search engines and 90% of the GPS systems in North America. Founded in 1938, ORC International is a leading global market research firm with offices across the U.S., Europe and Asia Pacific region. ORC International offers the unique ability to integrate primary research, secondary research, competitive intelligence and expert insight to address our client’s strategic issues. Our expertise is focused in the areas of Customer Strategies, Market Planning & Development, Employee Engagement, Corporate Brand & Reputation, Competitive Intelligence and on-Demand Business Intelligence. Clients are concentrated in Financial Services, Information Technology & Telecommunications, Healthcare and Public Services, reflecting our broad experience in these industries. The market research industry’s only true global boutique and a leader in the integration of research and technology, ORC International is known for the nimble, flexible and responsive approach we bring to the complex research challenges facing our clients worldwide. We are proud to be an official partner of CNN, the most trusted name in news, on the CNN/ORC International Poll.